Browsing Category: Displaying 1-8 of 8 Found. 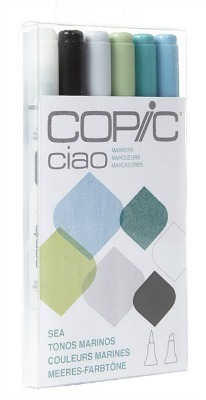 Copic Doodle packs are an easy, affordable introduction to Copic products. Each set includes a range of color-matched products that make for a great doodling experience. Perfect for testing out new marker techniques or for meditative pattern drawings. The Nature Doodle pack includes five Copic Ciao markers in B95, BV13, E04, V12, G82 and two Multiliner .3 tips in Wine and Olive. 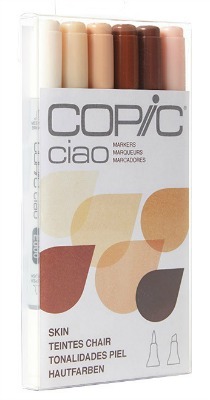 Copic Doodle packs are an easy, affordable introduction to Copic products. Each set includes a range of color-matched products that make for a great doodling experience. Perfect for testing out new marker techniques or for meditative pattern drawings. The People Doodle pack includes five Copic Ciao markers in E25, E33, E50, RV42, BV000 and two Multiliner .3 tips in Warm Gray and Brown. 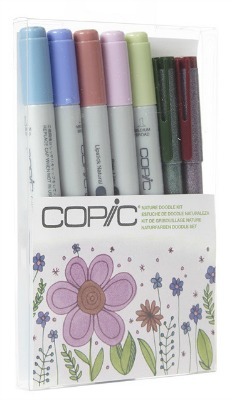 Copic Doodle packs are an easy, affordable introduction to Copic products. Each set includes a range of color-matched products that make for a great doodling experience. Perfect for testing out new marker techniques or for meditative pattern drawings. 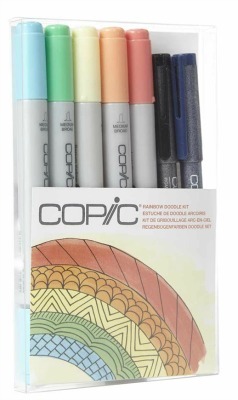 The Rainbow Doodle pack includes five Copic Ciao markers in B02, G02, Y00, YR02, R22, and two Multiliner .3 tips in Cobalt and Black. Copic Ciao alcohol markers. These refillable, double sided markers offer a dual brush nib and chisel nib. Ideal for illustrators, papercrafters, architects, designers and students. 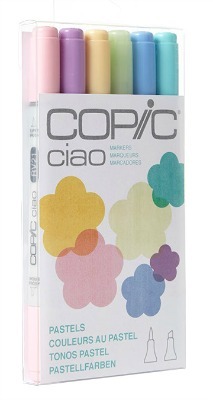 $29.99 A perfect starter set of 6 pastel coloured Copic Ciao alcohol markers. These refillable, double sided markers offer a dual brush nib and chisel nib. Ideal for illustrators, papercrafters, architects, designers and students. 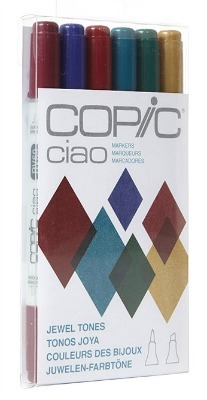 A perfect starter set of 6 primary coloured Copic Ciao alcohol markers. These refillable, double sided markers offer a dual brush nib and chisel nib. Ideal for illustrators, papercrafters, architects, designers and students. � This set contains the following colors: R37, YR04, Y15, G07, B29, BV08. 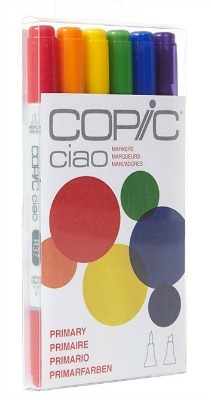 A perfect starter set of 6 bright coloured Copic Ciao alcohol markers. These refillable, double sided markers offer a dual brush nib and chisel nib. Ideal for illustrators, papercrafters, architects, designers and students.